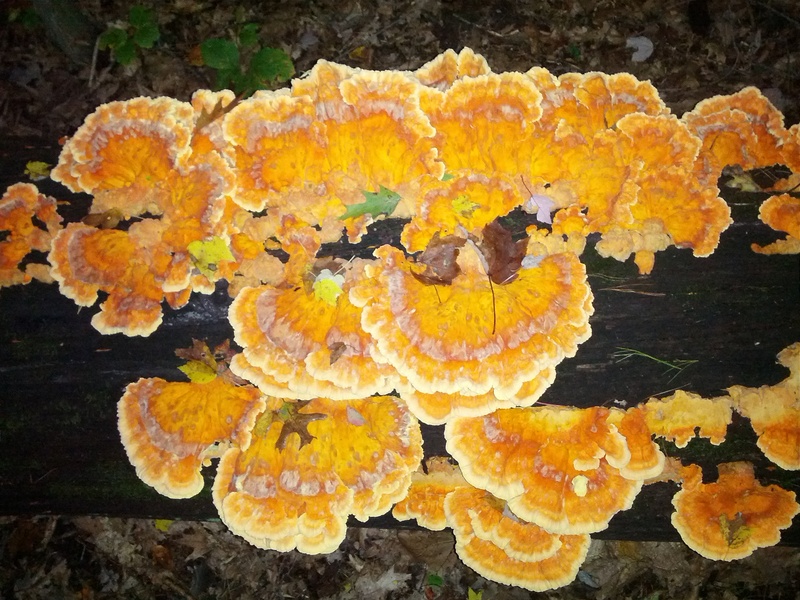 I stepped out for a quick look through the woods and I found two very large groups of my favorite mushroom, the chicken mushroom (also known as the sulpher shelf). The mushroom cooks up just like chicken, and is easy to identify. It's no Hen of the Woods in terms of flavor, but it is a delectable treat to be sure. What makes this mushroom my favorite is that it's the only one I have found with any regularity over the years that I could identify and take home to eat. 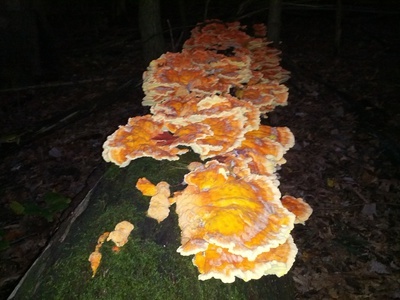 The first tree of chicken mushrooms are nearly full size, but young and tender, the perfect size for eating. Given much longer to age, these mushrooms will gradually become tougher, eventually growing into a typical wood-like indedible polypore. But right now they are delicious! 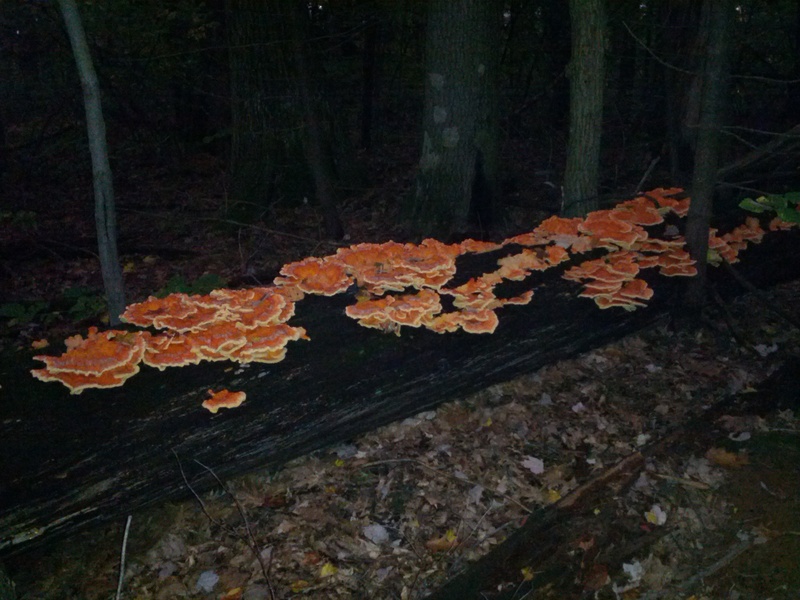 In fact, these are the best chicken mushrooms I have ever found. Here they are growing on a big old oak tree. I brought a few small pieces home to brush off, cook, and taste. If they are good I will be back! The mushrooms were perfect. I cooked them with oil, onions, salt, and pepper. Much like eating plain chicken breasts, these mushrooms would do well to accompany something. Today's find also included a large patch of mushrooms just starting to grow. I'd like to keep an eye on these to see how long it takes for them to be ready for harvesting. The mushrooms at this young stage were a perfect texture throughout. The flesh was still yellow and soft even at the base. I don't imagine these get much better. The flavor is mild, much like that of chicken breasts. The chicken mushroom parmesan was really tasty. I ended up returning to the above log and harvesting a large amount. There were probably 100 pounds of chicken mushroom on that log, and I froze 10-15 pounds of it. We used it all winter long, hesitantly at first, but our appreciation for them grew the more we ate. By the time it was all gone, we were sad not to have more. It was incredibly lucky to have managed to get some at the soft and tender day 4 stage. After that day-by-day they gradually become less tender and eventually tough, but are still delicious many days beyond day 4. * Chicken mushroom parm, prepared basically the same as chicken parm. 2 thumbs up. 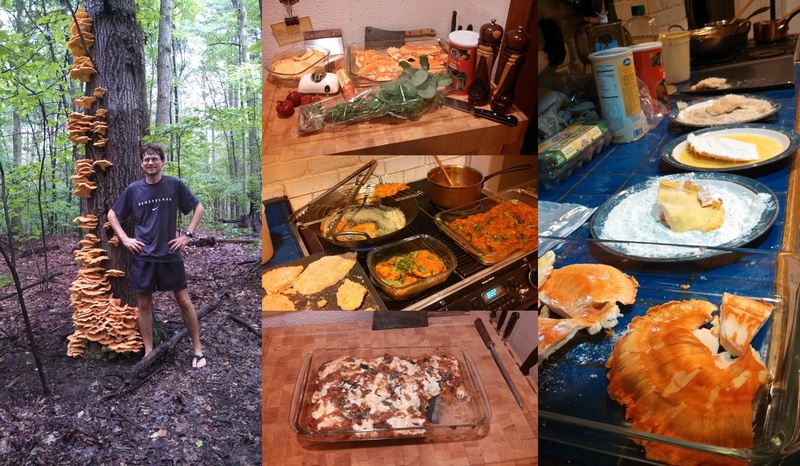 * Scott Jurek vegan burgers (click here) with copious amounts of chicken mushroom are to die for. They freeze really well and make a super easy, nutritious, and delicious meal later. Good enough to turn you vegan I swear.